Welcome Back: Jim Fortier and Howard Bacon have returned from Florida. Scott asked for help at the Bike Rodeo being held this weekend at Opechee Park. A sign up sheet was distributed. The date is this Saturday May 18th. Key Clubbers will be there to assist with fitting helmets. Scott will be calling Warren Mitchell to ask if he can help. 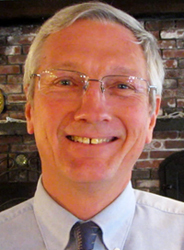 Although Warren is no longer a Club member, he was voted in as a member emeritus by the Board. NAPA is buying the bike which will be awarded to one lucky participant. Roger Landry asked that it be purchased from a local vendor and not at big-box store. Scott also reminded members that the next meeting is on the Tuesday after Memorial Day, May 28th. We will have a program and elections for next year's officers. Elections will take place at the Annual Meeting on Tuesday, May 28th. Jack Batchelder reported that donations are coming in well for the June 2nd Home Run Derby which will be held at Colby Field at Laconia Middle School at 11 AM. Registrations of participants will be reported on next meeting. Kathy Calvin reported she needs help for the final two Kiwanis KARES events June 6 at Pleasant St. School, and June 10 at Woodland Heights. A sign up sheet was distributed. 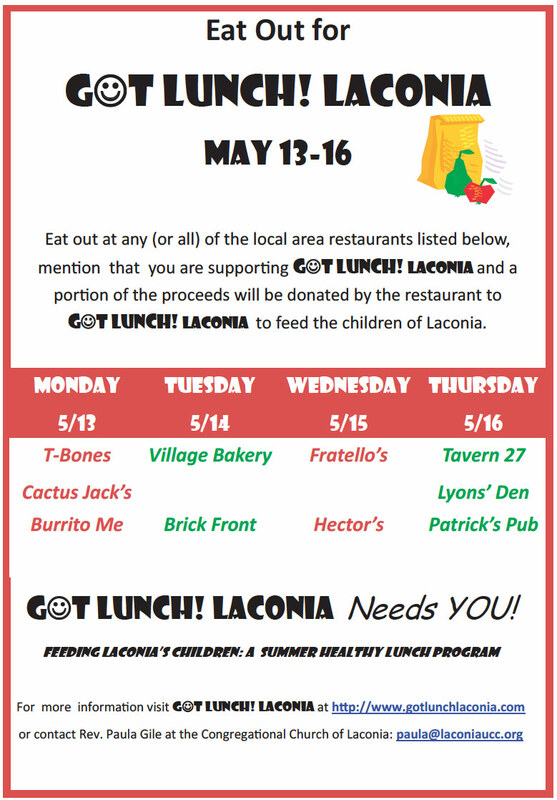 John Walker shared that today was the kickoff lunch at T-Bones/Cactus Jack’s for the restaurant week in support of Laconia today through Thursday of this week. For more information on the participating restaurants, "click" here. President Scott led a collection for the purchase of a granite paver in support of the Capital Campaign being held by Laconia High School for the new athletic fields. The club goal is to reach $1,000, and following tonight’s take of $95, we are now at $724. Betty Ballantyne shared that Irwin Ford is hosting a “Drive for the School” on Thursday, May 23rd, to coincide with the grand opening of the Huot Technical Center. 10-12 cars will be available for a 7-minute test drive. For each drive taken, Irwin will donate $20 to the LHS Capital Campaign up to a maximum donation of $6,000. Please consider participating, there is no sales pitch involved, it is a community support event only, and runs from 3-7 PM. 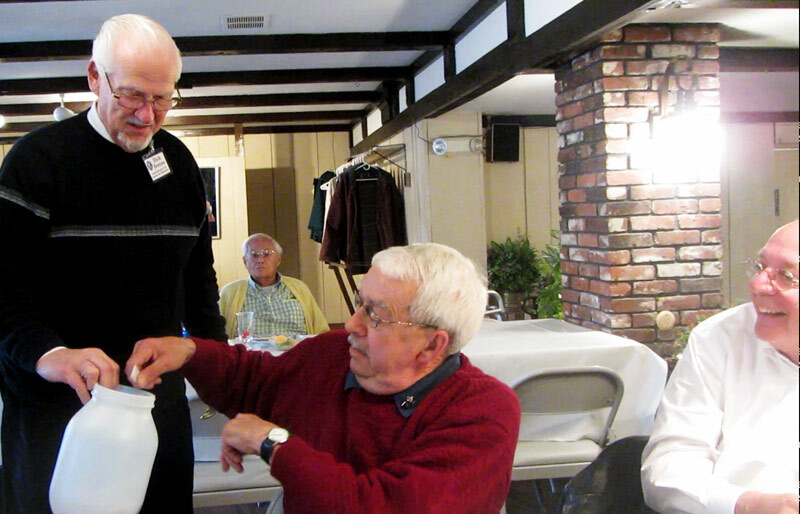 Jim Fortier draws the winning ticket as Joe Adrignola hopes for his first win in 2013. 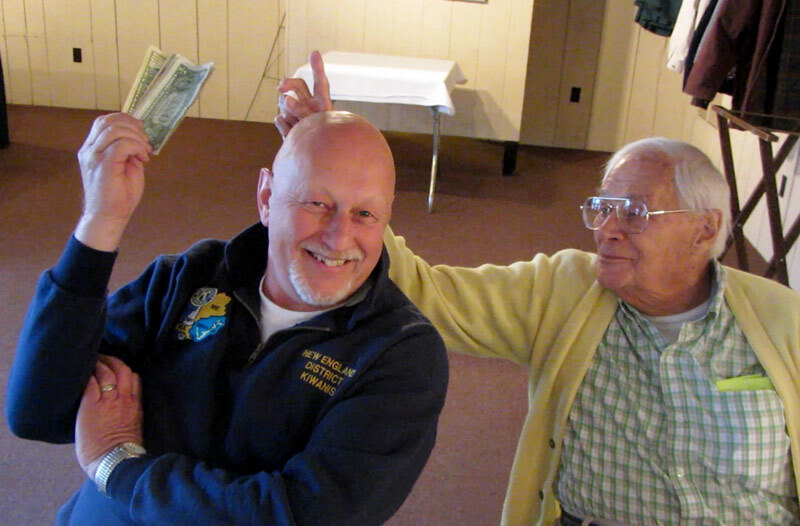 Roger Landry shows off his winnings while Howard Bacon shows off his sense of humor. $2 from Roger Landry because they were the last $2 he had. $4 from Steve Loughlin for the birth of his 4th grandchild, a healthy 8lb. 12 oz. boy, Luke Andrew Loughlin. $3 from Betty Ballantyne for the success of the recent Irwin Ford Ladies & Wheels, attended by 39 local women. The program has been a huge success and Betty is very happy about that. 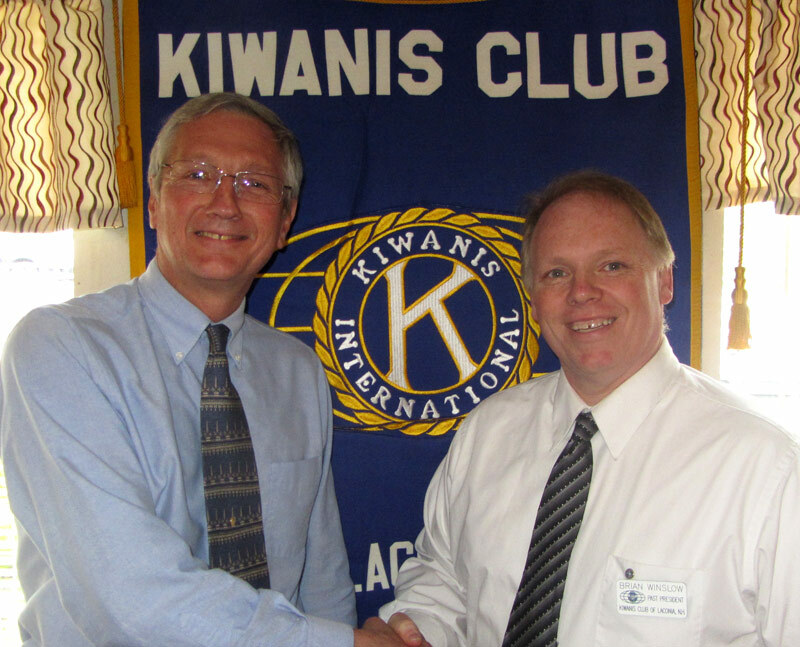 Brian Winslow introduced our guest speaker, Paul Charlton, Director of Marketing for Taylor Community. Paul stated his goal this evening was to help dispel some of the myths about “nursing home” living. 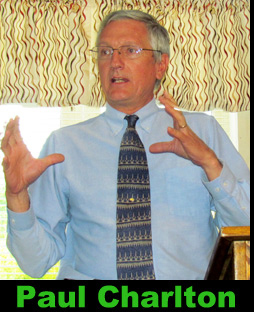 He stated that Taylor Community is a “continuing care retirement community” which has 400 residents in Laconia, spread over a 104-acre campus. Taylor is a 501C3 non-profit company. Paul discussed several of the contract options briefly but did not bog down into details. To give the club some idea of cost to a resident he described some of the “entry fee” numbers to span from $87,000 to $270,000 depending on the selection of care and size of the cottage or apartment. He stated that there is a monthly rental fee beyond the entry fee that ranges from $1,095-$1,500 per month depending on unit size. If the unit is an apartment, there is an additional charge of $125 per month for a 2nd person. •	Moving into Taylor for a purely Assisted Living option, where only a monthly fee is charged and no entry fee. •	Apartments or cottages are available for respite care. For example, an elder parent could stay there for a fee while the younger family was on vacation. •	A relatively new option is for a member of the community to contract now with Taylor, pay 25% of what the current entry fee is, but not move in. In effect, qualify now for residency, pay only ¼ of the fee, have full use of the amenities that all residents currently have, and not have to re-qualify for residency when the time comes to actually begin residency. Once it is time to move in, the balance of the then-entry fee is due. In other words, if you sign this contract and entry fees for your option is $200,000, but you wait 20 years to move in, you would pay the balance of whatever the entry fee is at that time, minus your 25% deposit of 20 years ago. One final note, Paul shared was that even though a non-profit, Taylor Community pays the city of Laconia $300,000 per year within what is known as the Gift In Lieu Of Taxes program. Paul encouraged members to drive through, walk through the community. It is not gated, and is a very community-supportive entity in our region. For more information on the Taylor Community, "click" here. Paul Charlton is congratulated on his presentation by Brian Winslow.